Orange County's only Ben & Jerry's shop is anticipating more than 6,000 ice cream lovers to turn out for its annual Free Cone Day on Tuesday, April 10. From noon to 8 p.m., the Ben & Jerry's at The District at Tustin Legacy will be offering a free cone to all guests. It's the 40th year the iconic ice cream brand has celebrated its Free Cone Day, and it's the Tustin shop's ninth year doing so. While you're getting your free cone, check out Ben & Jerry's custom made ice cream cakes. They even offer catering and will deliver ice cream right to your next party or event. 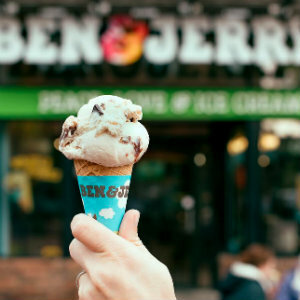 Last year, the OC Ben & Jerry's gave away nearly 7,000 free cones.